Most of you have probably experienced going into your favourite clothing retailer, electrical or furniture chain and being asked for your email address and/or mobile number? Often the retailer will promote this initiative under a ‘loyalty club’ or similar. It is in the retailer’s interest to add you to their database in order to market back to you. Retail is an industry which has been taking advantage of SMS for quite some time. Many retailers ask you to sign-up to their subscriber lists either in-store or online. Some retailers request email address only whereas many others will ask for a mobile phone number so they can communicate with you by mobile as well. Then on a regular basis the retail stores will send you offers via SMS – eg. Seasonally or around major sales time such as end of financial year, Christmas time and more. Seasonal campaigns tend to be more about educating customers on a new range/new look whereas key times for retail like end of financial year, the offers tend to have a financial benefit – such as percentage discount or fixed dollar amount off purchase. All about driving sales! Some more innovative retailers are also dabbling with MMS and seeing some amazing results. 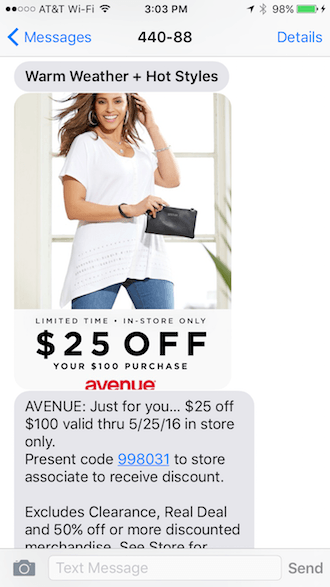 Avenue is one such women’s retailer in the U.S.A. seeing ROI as high as 6,600% by using MMS coupons and other MMS promotions. The U.S. based messaging provider Tatango document the great success of MMS marketing at Avenue in their article here, which includes detailed message examples like the one below. If you are an agency or reseller wanting to send retail MMS campaigns please contact us for more information and rates. We offer the best MMS rates in Australia. If you have any other comments or questions, or would like to share your own successes with MMS in the retail industry, then free to leave a reply in the comment box below. This entry was posted in Loyalty, MMS, Mobile Marketing. Bookmark the permalink.